Introducing a new title from author Richard Mitchell, Richard spent nearly 30 years in the police force and in that time was involved in all manner of incidents which, in his new book Just Got Time, recounts some of the funnier happenings. The book is a look back on the funny side of life seen through a Police Officers eyes whose humour often carries him through the more serious side of life (and death). Richard Mitchell started Policing within a rural force in the early 1960’s, no radios, no panda cars, (or traffic wardens) through various amalgamations ended in an urban conurbation with its high octane action. 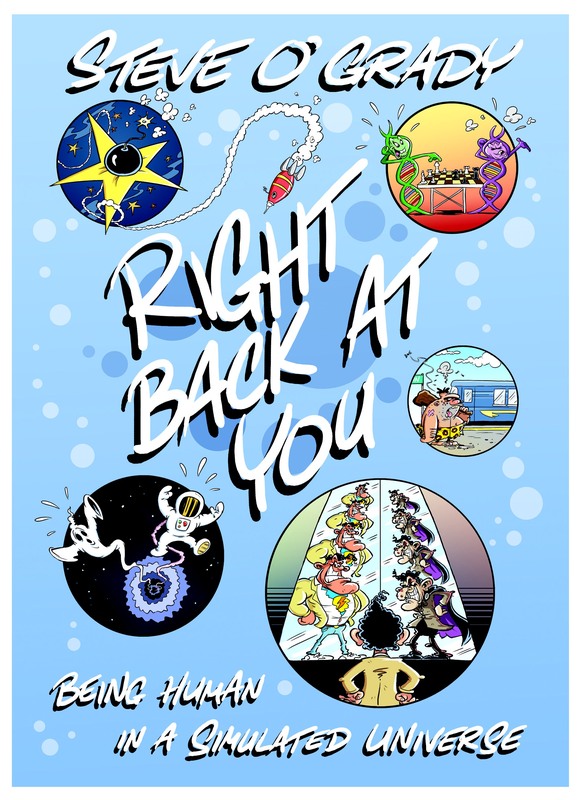 Introducing a new title, Right Back At You by author and Oxford University Press Bioscience Award winner Steve O’Grady. Also available in eBook format, please see the links below. Introducing the new title, Confessions of an Alcoholic Backpacker, an account of Ashley Moralee’s travels around the world whilst dealing with alcohol and drug abuse. Living with addictions can be a wild ride as an off the beaten track world traveller. Even though life will chew you up and spit you out in the most horrendous ways, the randomness of not having a secure home mixed with the fuel of substance abuse will provide you with mind expanding life situations that make things more than a little interesting. Here I have recorded some of my more brutal and unusual situations as a solo traveller struggling with addictions and give insight into the consequences that life entails. Also you will gain invaluable knowledge on some of the securities you need to take whilst living and hanging out with strangers in foreign lands, how to notice different street tricksters and understand some of the techniques they use to ensnare you. I realised my 17 year long Journey that has seen me charging all over the planet on a rock and roll life style had to come to an end for my own survival. For years I literally did not know what the hell it would take. Nothing seemed to kill me or halt my destructive ways that was until I recently returned from the Far East and I want to share what I have learnt with you. For more information and to purchase your copy, click here. Introducing the new poetry book from Glynn Sinclare, Poetics – Book Of 100 Poems, writen by Glynn Sinclare and illustrated by Limmerick based artists as well as some of Glynn’s own works. I am very proud of the fact that I am a Limerick Poet and Author of the Emigrants, written under my “nom de plume”Glynn Sinclare. Three Limerick Artist all lived at one time or another on Farranshone (my road) in Limerick City. Each of them gave permission to add a copy of their painting in black and white to go with one of my poems. Filipino artist Marichit S Garcia. A catalogue of her art project number 348.64-5 can be found at Brooklyn Art Library. I am very grateful to them all. The painting on the cover is by Joyce Shee, her interpretation of a photo she once saw, I fell in love with it. It stirs memories of a date. Going to the cinema on a rainy Limerick night, passing the railing of my grandfathers house in Pery Square. These poems are dredged from some spaces deep within my brain and heart. For more information and to purchase your copy click here. New book by Author and Poet Glynn Sinclare. We are happy to announce the new title from author and Poet Glynn Sinclare. Following the success of her book, The Emigrants, Glynn has writen her new book “Poetics – Book of 100 peoms” which is due out at the end of this month and features illustrations from Limmerick artist Joyce Shee, amongst others. Watch this space for launch. Although ShieldCrest’s authors are from all over the world and its eBook sales have always been available worldwide, the UK has always been the predominant market for sales of hard copies. One of the reasons is, of course, the cost of moving heavy paper around the world. However, it has now established marketing and printing of its books in key locations throughout the world, including the USA. This makes it much more accessible to interested purchasers overseas who can obtain copies of ShieldCrest author’s books from local retailers with their books printed locally. ShieldCrest is already established as the leading self-publisher for service, price and quality. This has largely been achieved because it publishes all its author’s books in-house and this move further secures its rapidly increasing dominant position in the market. There will be a major announcement towards the end of the year of the company’s expansion into a new area of publishing so to ensure you don’t miss this and to keep up with all the company’s activities, its authors and new book releases make sure you add your email address and follow these announcements. Introduction The Smell Of Apricots a collection of short stories, the new title from seasoned author Dominic O’Sullivan. In 2009 Dominic published his first collection of short stories ‘Swifts’ of which the title story was performed as a play in the Chocolate Factory, North London. A number of the short stories, New Wave, Birdsong, A Dash of Soda, Undercover, The Open Window, Portal and Dreams, have been performed at the ADC and Boathouse Theatre, Cambridge as part of their annual season of monologues, duologues and short plays. How about a trip to confession? What’s happening in both sides of Germany? A trip to the coast could perhaps change your life. And why have bird impressions suddenly become popular? All is revealed in this varied collection of short stories. In this collection ‘Elemental’ was performed at The Black Hostelry in Ely in May 2018.